Flames of Light, such as the Violet Flame, White Fire of AN, and the blue flame of Achangel Michael, have been widely known and used in the last few decades on Earth. However the use of Liquid Light is not so widespread. Flames of Light and Liquid Light are higher dimensional energies which are the origin of physical reality. For example, golden Light is the substance from which physical gold (and other golden crystals) are created, gold litterally is densified golden colored Light. The same applies to silver, and many crystals, and actually the same applies to all physical matter, as it is known in physics that each different atom has different frequency, and these frequencies correspond to colors, so all physical atoms are manifestations of densified frequencies of various colored Light. When we use these colored Light in meditation, visualization, intentions, etc, something real and factual happens in our higher bodies (4D 5D and above, or in other words etheric, astral, Soul etc), these colored Light are transmitted by the higher bodies which is having a direct effect on these planes (etheric astral etc) and an indirect effect on physical reality, because matter is always flowing between physical and other planes in both directions. A practical example of this is that the regular use of golden Light can help to attract physical gold. However it is good to understand that the real energy of gold and golden color is not really about mainstream financial affairs but instead its essence is about transmitting the energy of Higher Self/Soul, like a Sun or a Star, and this is the original reason why it was used widely by ancient cultures. Using colored Light in the form of flames or liquid adds a specific elemental quality to the energy. In some cases it is very beneficial to not use only flames of Light, and to balance them with the use of Liquid Light. Especially for people with sensitive energy field that can become tired and overloaded by of a lot of stimulation and strain from modern lifestyle, Liquid Light have a more gentle, soothing, nurturing, feminine quality just like physical water has, which can be very beneficial to balance the stimulation and clearing of flames of Light. Many colors and combinations can be used beyond the famous ones like Violet Flame, in plain Light or flame or liquid or a mix. Here are a few examples. Liquid Rainbow Light is a very powerful energy which has many many benefits and is used a lot by many cosmic beings and star family. It is very good to help create consciousness of Oneness, to transmute and heal among many other benefits. White pearly liquid Light has a very potent divine feminine presence, gentle nurturing energies of harmony and peace and Goddess archetype such as Tara and Quan Yin. This is a very good combination and complement with the White Fire. Bright aqua colored Liquid Light is also very soothing and healing, with energies of innocence and joy and togetherness. There are many more and everybody is free to experiment with them, as various possibilities can suit different beings at different times. These workshops will contain mostly practical energy exercises, done individualy, or in pairs and groups. We will talk a little to explain the process but we will avoid too much theoretical talking which can be forgotten or missed easily, and instead we will maximize the time for practical applications and experiences, which can create much deeper transformation and understanding. These practices incorporate together all aspects of our being in a coherent way : Soul/Spirit presence, mental, emotional and feeling, energy work and visualizations, and gentle physical movement. Involving all aspects of ourselves allows deeper experiences and transformations. This can include meditation, breathing, dancing, group hugs, etc, all incorporated together. This can then benefit all aspects of our lives. Participants can keep using the exercises and tools practiced in the workshop, or draw inspiration from them in their own way, for their individual spiritual practices and local group meetings. All workshops will be done in vortex area with nature energies to support our process. All who come with a genuine loving intention are welcome, we will be happy to see you there. Number of seats are limited and previous workshops were often fully booked, so we suggest to sign up in advance as much as possible. The energies of planet Venus are clearly at the center and forefront of this coming months of October and November. From December onwards will start a period of 2 years of very powerful and unusual planetary alignments which will potentially bring many changes in our lives. This month of October especially is a period focused more on inner work, inner changes, shadow work, recalibration, etc, which is in a way a preparation for the coming years. The energy of planet Venus is leading this inner work as she is about to go retrograde on October 5th, which will last for 40 days until November 16th. This is a powerful time of rebirth, which starts a new Venus cycle of 19 months, known as the Venus synodic cycle. This Venus cycle of 19 months is corresponding to the Moon cycle of New Moons and Full Moons. For Venus, the middle point of Venus retrograde corresponds to the New Moon, this is basically the New Venus, which happens only once every 19 months, and this time it will happen on October 26th, at 2:16pm UTC. At this time, Sun Earth and Venus align, and Venus is at her closest point to Earth. To understand this process a bit better, let's widen our point of view a little. Everything in creation is breathing. Breathing is basically a flow of energy in and out, and the main breathing of the Universe is usually called the Great Breath, this is the breath of Source, it is a cycle of many trillions of years, which starts with the creation (breathing out) of the Universe out of Source (Source is our state of pure Oneness, pure singularity, no time and space), and then the Universe is breathing back in to Source. From this Great Breath of Source, everything in creation follows, and breathes too. Our process of breathing is basically a flow of energy between the lower dimensions including the physical, and the higher Soul spiritual dimensions. Energy appears into the physical by flowing down from the world of Soul, and then ascends away from physical going back to Soul. When we breathe in, we breathe in energy from Soul into our body. When we breathe out, we breathe out energy from our body back to Soul. The seasons of Earth are the breathing of Earth. Spring and summer are the breathing in, autumn and winter are the breathing out. The Moon cycle is the breathing of the Moon, from New Moon to Full Moon is breathing in, from Full Moon to New Moon is breathing out. So the Breath of Venus lasts for 19 months. Venus is the lover, beauty, harmony, sensual archetype of the Divine Feminine. At the mid-point of her retrograde phase, Earth Sun and Venus align, Venus is at its closest point to Earth, this is called the inferior conjunction, this is the New Venus. At this time Venus is invisible in our sky. One week later, Venus reappears in our sky, and starts her Morning Star phase which lasts for 9 months, this is the time when Venus is visible in our sky in the morning before sunrise, which is the breathing in, the pouring of Venus energies from Soul to physical. Then she is invisible for 2 weeks, and the mid-point of this 2 weeks period is when Venus is aligned with the Sun and Earth, behind the Sun, this is called the superior conjunction, this is the Full Venus. One week after the Full Venus, she reappears in our sky in her Evening Star phase for 9 months, which is the time when Venus is visible in our sky after sunset, this is the time of breathing out, of rising of Venus energies from physical back to Soul. The New Venus is, like a New Moon, a time of new beginnings, of setting intentions for the next Venus cycle of 19 months. Then as the Morning star phase (inbreath) starts and Venus turns direct again, this is a time of outpouring and renewal of Venus energies of beauty love and sensuality in our lives, which lasts for 9 months. At the end of this comes the Full Venus which is a culmination of the manifestation of Venus energies in our life. Then comes the Evening star phase (out breath) which is a time of letting go, clearing, inner self love, releasing the old, and raising our consciousness regarding our connection to the Venus energies, which lasts for 9 months and ends with a new Venus retrograde which starts a new cycle, a new Venus Breath. 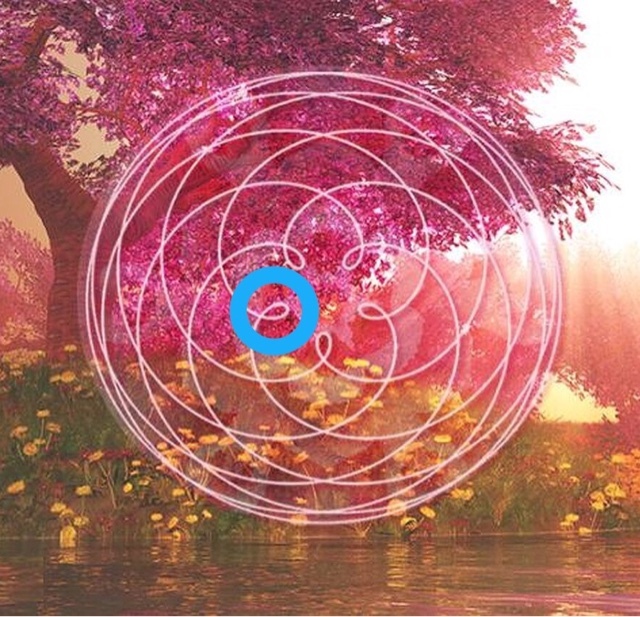 The 19 months of Breath of Venus resonates with the flower of life, as there are 19 circles in a flower of life : 1 in the center and 18 around it. Venus is invisible for 1 month and visible for 18 months during her cycle. The 40 days and 40 nights length of the Venus retrograde is alluded to in many other ancient myths, from Jesus to Buddha. Friday is Venus day (Freya's day), and Venus will turn retrograde on October 5th (7:04pm UTC) on a Friday. The New Venus on October 26th (2:16pm UTC) is on a Friday, the Morning star phase starts on November 2nd sunrise on a Friday, and she will turn direct on November 16th (10:51am UTC) on a Friday. The first 20 days of Venus Retrograde from October 5-26 is especially dedicated to inner work, shadow work, release, let go of the old, finding love within and universally. The October 26th New Venus is the turning point, the actual beginning of the new cycle, the best time to make ceremony to set intentions for the next cycle. During these first 20 days, will be the New Moon on October 9th (3:46am UTC). This will occur in Libra which is one of the zodiac signs of Venus. It will be making a square aspect to planet Pluto which is the planet of death and rebirth, alchemical transformation. This is especially a good day for shadow and inner work, for retreating from the external world, and going far and deep within, into the universal Ocean of Love, where all can be released and renewed. Around this time of October 9-10, Mars also enters new territory, he finally moves forward, out of the territory he was covering during his last retrograde phase. Also Mars makes a square aspect to Venus around the same time. This is significant and shows that we are moving into new territory although we are working more inwards. The masculine energy review is completing and Mars is 'back to work'. The aspect between Mars and Venus invites us to work more on conciling masculine and feminine energies in our lives. 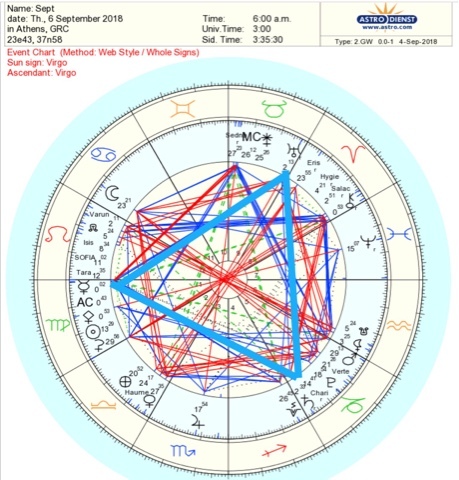 Around the same time Mercury and Moon enter Scorpio together, and make an opposition to Uranus and asteroid Magdalena (which is signifying downloads of energy and insights especially assisted by the Magdalene archetype), this is amplifying the energy of transformation, deep inner work and rebirth. This period of time around the October 9 New Moon is very much about going inwards, taking responsibility for everything in our life, avoiding external tension and projections, and working more within. This inner work will then reflect in our external life. A few days before the October 26th New Venus, is the Full Moon on October 24th (4:45pm UTC). This is a Full Moon in Taurus, which is the other zodiac of Venus, this in itself is a powerful coincidence. Additionally, the alignments at this time are significant, as the Sun is conjunct Venus and the Moon is conjunct Uranus. This is a day of more downloads of energy and insights, to especially assist the ending of the old Venus cycle and the beginning of the new. After the October 26th New Venus, will come the last 20 days of Venus retrograde, during which the Morning star phase begins on November 2nd. This is a time of entering into the new Venus cycle, of preparing and visualizing the new. As we enter into November we will have more alignments for this whole process which I will post about then. This is the first of a new project of summarizing the key planetary and star alignments for every coming month. I am not making any prediction of what is going to happen, as that is always up to free will, I am just reading some of the energies coming to us from the sky. 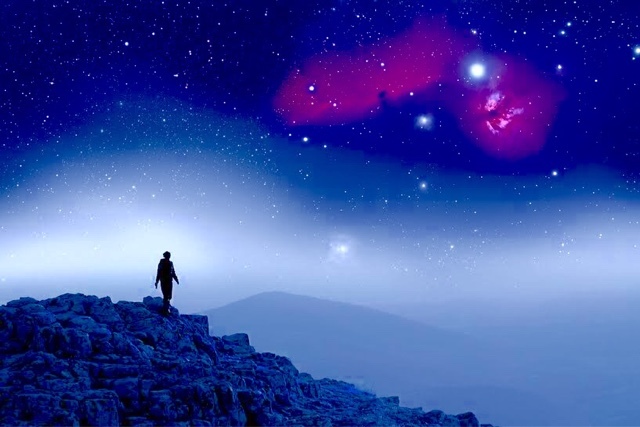 The purpose is to assist people to navigate the energy flow of the days, and for people to be able to time their energy work and projects to the planetary alignments. Of course I can not address all aspects and all energies of the month so I am focusing on the most significant moments as I see them. This summer has seen a lot of retrograde planets, bringing a lot of focus on inner work, review, re-evaluation, shadow work, etc. Since the end of august and as we go through september, planets turn direct again and we are entering a new phase with new projects, more action and covering new territory as we integrate the lessons of this fading retrograde season. Tomorrow, on september 5/6th, a grand trine involving Mercury and Athena in Virgo, Saturn in Capricorn, and Uranus in Taurus will activate as Mercury and Athena enter Virgo. This grand trine will be further activated as Saturn who has been retrograde, stations and turns direct again, on the same day. This is a powerful energy which will be active and will build up for several days and will culminate at the powerful new moon on 9/9. It is a grounding stabilizing energy (Earth trine), to assist us to bring Light in our lives and in our minds, to separate the wheat from the chaff, to get new downloads and insights in order to move forward and ground, stabilize and manifest our new projects. The new moon in Virgo on 9/9 has many interesting and powerful planetary alignments. Venus in particular is in focus, as she enters Scorpio just a few hours before the new moon. Venus is now at its closest to Earth so her energy is stronger and she is also about to turn retrograde in early october. She is now covering the territory which she will revisit again twice as she goes retrograde and turns direct again, so the questions and aspects of our lives that will be worked on during retrograde are being brought to our consciousness through september. This whole process is happening through the end of 2018 and is a major theme for the energies of these next few months. Venus is the energy of the Goddess, lover, and beauty archetypes in all of us. When she goes through the retrograde period, this is a period of facing and reviewing how we relate to this within us. The main question is what inner aspects of us that relate to these Venus energies are we externalizing and attracting outside in our circumstances ? We will talk more about this process over the next few months as she turns retrograde in october. Venus is doing this whole process in the signs of Libra and Scorpio, which is very significant. Libra is her home sign so she is stronger there, it's the energies of partnerships, justice and balance. Scorpio follows Libra, bringing the results of that partnership : merging, transformation, alchemical death and rebirth, alchemical marriage, etc. 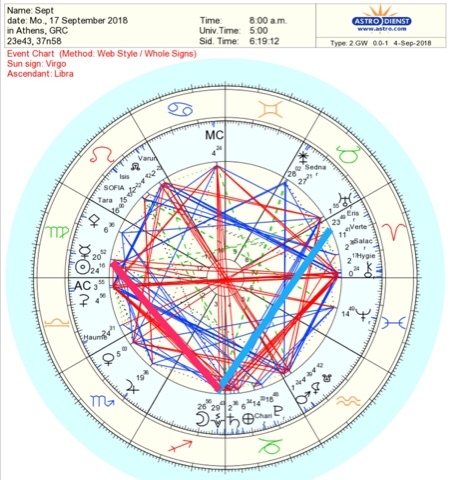 These are important themes for Venus and is it very significant that she will cross from Libra to Scorpio on the day of the new moon, just 8 hours prior. The kite is a completion of the Earth grand trine we mentioned earlier. The energy of the grand trine will be channeled into the rebirth of Venus energies as she enters Scorpio. Uranus is especially important here as he is in opposition to Venus and will be involved in all the aspects. Uranus is the energies of inter-dimensional communication, downloads and insights, that in this case will assist the rebirth of Venus Goddess energies during the new moon. The grand square involves Lilith south node, and Varuna north node, which will bring the energies of our cosmic origins (Varuna) and the cosmic womb (Lilith) in this process. This new moon is in the sign of Virgo, which is one of the archetype of ancient temple priestess, the energy of creating order and birthing Soul energies through the physical body. Neptune in Pisces in opposition to the new moon brings energies of Oneness into the picture. The sextiles between the new moon, Jupiter, Pluto and Neptune, all in feminine signs, bring an energy of ease to surrender into the unconditional Goddess presence. This will also last for a few days after the new moon. There are other powerful aspects at this new moon but covering it all would be too long. The energies until this new moon are stabilizing and softer, and the energies that will come after this new moon are more about going forward and making things real. 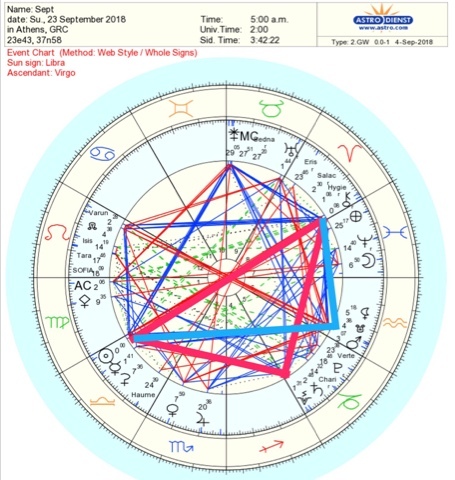 On september 11, Mars enters Aquarius. He is covering the same territory that he did during his retrograde phase and so this is bringing conclusion, putting the lessons into practice, for this process. 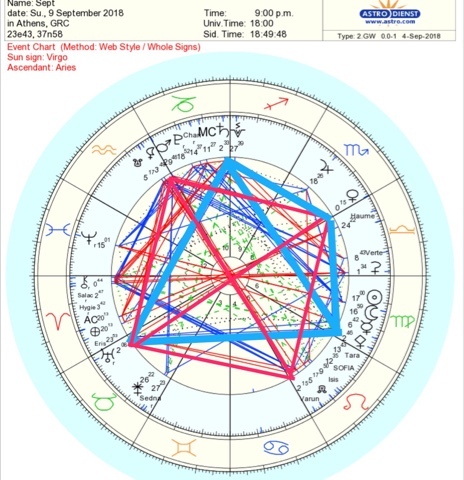 As Mars enters Aquarius this activates a double square between Venus Uranus and Mars. 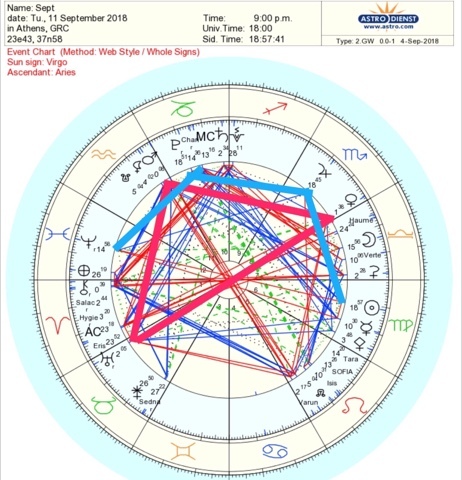 This very much amplifies the energies and connects together Mars and Venus and the retrograde process of inner review they are both going through this year, so this aspect is very much about conciling masculine feminine and male female and opposite polarities. Uranus brings an energy of unexpected events and actions, release of pent up energies, and downloads and insights. This will start on september 11 and last over the next few days and it will be a time to be careful about tensions, to stay calm and use situations constructively, to avoid polarizing situations too much, to concile polarities involved in the situation within us and to look at the higher purpose behind the situations. On september 17 around 5am UTC, the moon aligns in the direction of the Central Sun together with Vesta. 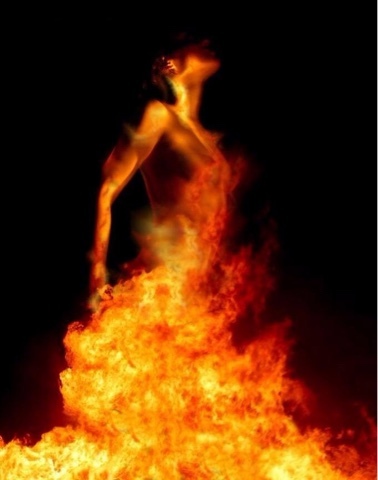 Vesta is a priestess archetype who is keeper of the sacred flame of the Goddess, the fire representing the manifested Light presence of the Goddess on Earth and the kundalini energies. She has been aligned with the Central Sun direction for a few months and this is the last few days of this alignment. This energy aligning with the Moon will last for a few hours before and after 5am UTC and is a very good time to do energy work, in particular to bring Central Sun and Goddess energies on Earth, with sacred sexuality/kundalini work and/or other practices. This can help to bring resolution and release to the intense energies of this period. Then will come the september equinox on the 23rd. At the equinox the Sun enters Libra, bringing energies of Justice, Balance, reconciling opposites. The Sun will be opposing Chiron and asteroid Hygeia in Aries, while Vesta together with Saturn in Capricorn form a double square with Sun and Chiron. Chiron and Hygeia in Aries represent the healing of our core wounds. As they oppose Libra this is the energy of inner understanding that can bring reconciliation and forgiveness within. Saturn and Vesta together joining in this process is about facing reality, seeing the effects of causes and transmuting them into Light with the sacred fire of the Vesta Goddess. Mars and south node together in Aquarius will be trine to the Sun and sextile Chiron and Hygeia, assisting us to take action, trying new different approach and insights to address our past accumulated energies and assist the healing process. Two days later the full moon comes and the Moon will be aligned with Chiron and Hygeia at this time, bringing more energy and Light into this same process. So this is a powerful period of time to do shadow work, healing work, addressing the core wounds of relationships to others and of human society as a whole, transmuting them into the sacred Kundalini fire of the Goddess presence.